Hiking is an activity that would give you lots of fun and adventure. Going hiking with your friends is definitely an exciting way to spend a vacation. Like any other activity, this also requires careful planning to succeed. Planning will enable you to choose the best site for this activity. Below are steps that could guide you in planning for a hiking trip. Step 1: Choose a hiking park. The first thing that you should do is to select a hiking park or area. You have to make sure that you ask your friends about this as well. If they have none to recommend, you and your buddies can surf the Internet together. Step 2: Research for information. You have to choose a hiking park that would be suitable for your budget. Make sure that the park also has lots of attractions to offer. It is also best to choose the one where you can have amenities that would make your stay comfortable. After you have made your choice, find out other things and areas in that specific park or area that you can explore. 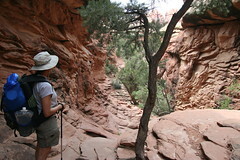 Because hiking is an interesting activity, it is not surprising that there are also lots of people who engage in this. This is why you really have to contact the park’s management and book in advance especially if you hate overcrowded hiking destinations. Step 4: Familiarize yourself with the place. To enjoy the best things that the hiking park can offer, it is best that you familiarize yourself with the amenities and the attractions in that place. You can do this by doing research online, procuring a map, and asking someone who have gone there about his or her experiences. Step 5: Prepare your supplies and gear. Last but not the least, you have to make sure that you have everything that you need with you when you go on your hiking vacation. The supplies and hiking gear that you should bring include your clothes, tents, flashlight (if you are staying for the night), and food supplies. These easy to follow steps can help you achieve a more enjoyable vacation. Don’t forget to inform someone back home regarding your plans in case there’s an emergency. Although it is a given that Hiking can be a fun way to hang out and bond with friends and family members, always remember that safety must be your top priority. Do some research about the place, ask the locals about the humidity and other paths towards the top of the certain mountain. It is also better if you have a tour guide with you, especially on your first try, so that you have somebody who has sufficient knowledge about the place and avoid getting lost. And just in case of emergencies, bring a First-Aid kit filled with stuff designed to treat minor wounds, scratches and sprains. It is best that you divide your group into small teams when going camping. This way, everybody is involved in keeping the group safe and sound. Assign a leader who will act as a facilitator and will take charge in securing your safety. Hand over the medical kit to one group and food and water to another group. Delegate tasks to several other teams such as finding a nearest resting place, looking out for insects or snakes and other dangerous animals to warn other teams, seeking water source, and one team should handle the map or a GPS device.